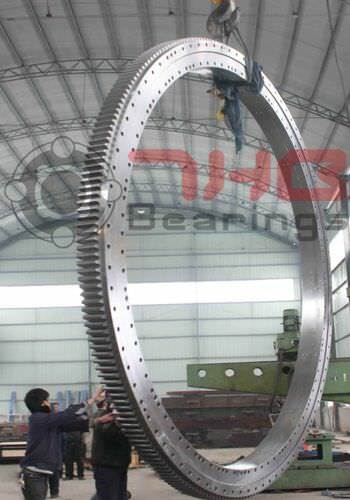 Exported from China, the largest and the most versatile and unique slewing ring ensures best and stable mechanical property under extreme circumstances. The 3 rings are forged and each ring is unitary to guarantee the hardened depth on the raceway, a test was made before the induction hardening. The ring has an outer diameter of about 6000 mm and the weight is over 13 metric tons. The structure is triple row cylindrical roller type with external gear. The slewing rings are exported to Europe for broad application on ships as the bottom of cable basket. The final assembly involves the slewing ring lubrication by Lithium grease. The cages of first and second row of rollers are made of aluminium alloy or option is the Nylon cages. Finally the cages of the third row of rollers which is called “ the spacer" are made from nylon.